Bettys Tea Rooms is one of those Yorkshire icons which must be visited if ever you are in the vicinity of York or Harrogate. I only managed a five minute visit on my one and only trip to York, but it was five minutes that has lodged in my memory. The place was crammed with delicious looking baked wares, fine teas and artisan chocolates as well as afternoon tea revellers. I had gone in for a curd tart, having been told by a Yorkshire colleague before my trip that this was a must. I had no idea there would be chocolates too. I ate the curd tart on the train home and mused on the delights I could have tried – not that I was the least bit disappointed with the curd tart, it was delicious. One day, I shall go back to Yorkshire and pay a proper visit to Bettys. Luckily, a couple of years later, which happened to be last week, I finally got to try some of those tempting looking chocolates. When offered a box of Bettys Dark Chocolate Selection to try, I was not going to say no. Last year I was sent a Bettys Christmas Chocolate Gugelhupf which I was really impressed by, so my expectations were running high. A delightfully elegant little box duly arrived in the post. As I am usually motivated by quantity as well as quality, at first glance I was a little disappointed at how small the box was. I needn’t have worried. When I opened it, not only were my nostrils filled with the wonderful aroma of dark fruity chocolate, but my eyes were filled with the sight of fourteen very tightly packed and rather attractive chocolates. With fourteen chocolates and six different fillings, I was bound to find something I liked. Most were covered in a glossy dark Swiss chocolate couverture which was rich with fruity notes. All of them had that lingering-on-the-palate characteristic, which I take to be a sign of good quality chocolate. I tried them in the order in which they appealed to me. I enjoyed every one of these and am happy to report that the standard of Bettys chocolates is as good as I hoped it might be. And as for the matter of the small box, a little goes a long way. Spiced Port Truffle – I was particularly taken with the ying yang pattern in dark and milk chocolate. This was a Christmassy truffle if ever there was one. I couldn’t quite identify the “stollen” spices, but they were definitely there and combined beautifully with the port, which was very noticeable. I felt the warmth travelling down my throat and body in a most delightful way. I thought I detected orange. CT also noted citrussy flavours along with cinnamon and just a hint of nutmeg. Vanilla Caramel Heart – Brushed with gold, this looked particularly elegant. I’m a sucker for a good caramel, so I was pleased to see there were three of these in the box. A pleasant note of bitterness from the dark chocolate combined well with this sweet and creamy vanillary caramel, which we both found most pleasant. Orange Marzipan – This had a lovely scent of orange. I adore marzipan, but often find it a little too sweet. This was the case here, but the flavour was excellent and lingered on most pleasantly in the mouth well after all traces of the chocolate had been consumed. It had a good chewy texture. CT who is not a fan of artificial tasting orange chocolate, really enjoyed this and found the bitterness of the crystallised orange peel made for a more authentic experience. Cru Sauvage Truffle – Goodness these were nice. A rare dark chocolate from the Bolivean Amazon was dusted with cocoa and covered a soft and very smooth rich chocolate ganache with toffee notes. I would have been very happy with an entire box of these. As it happens Betty’s do sell such boxes. The others were all delicious, but this was by far and away my favourite. We noticed the difference in the chocolate which CT described as having an oaky quality reminiscent of whiskey. Raspberry Ganache Truffle – No mistaking this one, the aroma of raspberries was strong. Tart fruity raspberries in a smooth ganache and not overly sweet, these were good too. Cognac Truffle – To me cognac conjures up images of sophistication and that was definitely the case here. With its smooth ganache, this was delicious and indulgent. It felt as though one of these might even put you over the limit. CT thought it had a definite restorative quality. If, like me, you live a long way from a Bettys Tea Room, you can still buy a goodly number of things on their online shop. They have quite a selection of Christmas items on offer including some very special hampers I’d be utterly delighted to recieve. This 115g box of chocolates cost £15.95. 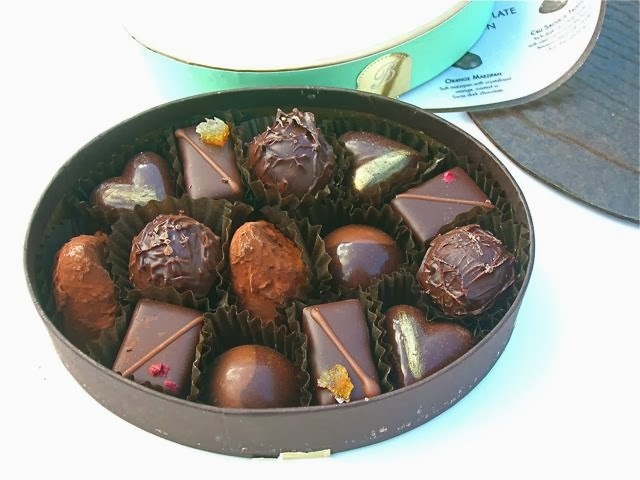 Bettys have kindly agreed to give one of my readers a Dark Chocolate Selection box too. To be in with a chance of winning, please fill in the Gleam widget below. You will need to leave a comment on this post which then gives you additional chances to enter if you so wish. Gleam will pick a winner at random from the entries received. If you are commenting anonymously, please give me some way of identifying you as I will be verifying the validity of entries. Any automated entries will be disqualified. This giveaway is only open to those with a UK postal address. Because of the Christmas rush, winners will need to respond within 24 hours of being contacted. Failure to do this will result in another winner being picked. Yorkshire tea – a family favourite! I love a bit of parkin! These chocolates look lovely – although I’d settle for a whole box of the caramel hearts! oh – and I have liked your facebook page and follow you on twitter, but I am not prepared to let the widget access so many details, so I’ll stick to the one competition entry! I do understand Alicia and thank you for liking my Facebook page anyway. ohhhh has to be Tea!! Yorkshire Pudding & Hendersons Relish – a real Yorkshire delicacy! Definitely Yorkshire puddings – I can’t believe I’d never eaten one until a couple of years ago! Hardly original, but another vote for Yorkshire pudding! It has to be Yorkshire Pudding! Yorkshrie puddings are my favourite! Don’t know much about Yorkshire food, but had a parkin a few times and enjoyed it. I love Wensleydale with fruit cake and I really thank the person who introduced me to that some years ago! I’ve visited Bettys a few times when I lived in Leeds a few years back. Their food was always delicious. These chocolates sound divine and I love how they have some differenet flavours in there. Dark choc too – yum! I live in Yorkshire so have an array of Yorkshire foods at hand; my favourite is Yorkshire Parkin. A cup of Yorkshire Gold Tea with a Betty’s Fat Rascal! Yorkshire Puddings with beef and gravy or ice cream and fudge sauce both are just amazing but Yorkshire Puddings yep! Has to be yorkshire puddings! Can’t beat a Yorkshire pud! Yorkshire puddings…and NOT the frozen type, from scratch only. I like a bit of Parkin. They look wonderful, total diet breakers! has to be a good cup of tea for me! You cant visit Yorkshire without popping into a tea room and having some Yorkshire Curd Tarts-they are my favourite yum! Yorkshire Puddings… and I do make rather good ones, if I say so myself. Oh it has to be Yorkshire pudding! My Gran was a Yorkshire lass and I still have relations over there, so we have been into Bettys in York, yummy cakes. Make my own yummy yorkshires to my grans recipe lol. Everytime they puff up and look great I think she is looking down and nodding her head lol. Yorkshire puddings – my brother makes the best ones ever. Gotta be Yorkshire puds and gravy. Proud to be from Yorkshire! Yorkshire pudding definitely! I’d never had one before I moved to Yorkshire! Yorkie puds..but with jam and cream ! I have used Bettys tea rooms before and very much enjoyed their lemon curd cake. Tasted fresh and light and delivered carefully in beautiful packaging. has to be Yorkshire Pudding!